Taking in a deep breath – finally some sea-level air!!! Arica was the first stop in Chile, and after a long day in a bus/car, we were excited to enjoy some sand, waves and sun. 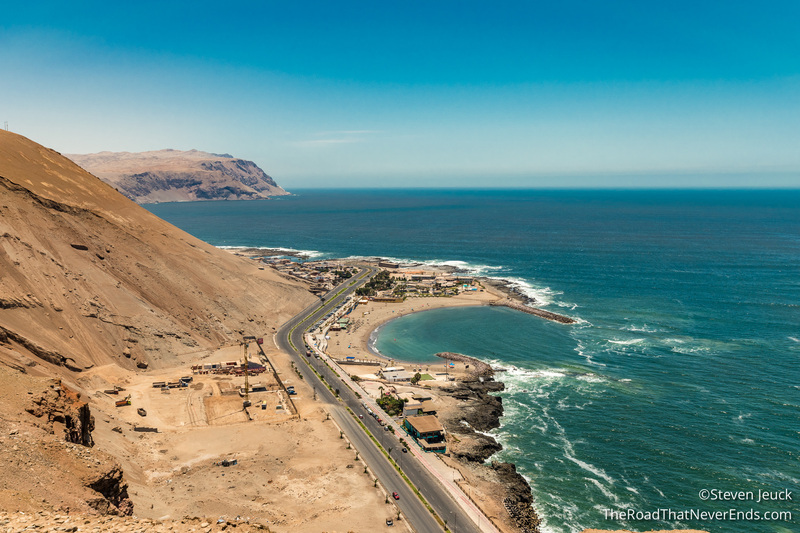 Arica is just 30 minutes from the border of Perú, making it a backpackers dream to take a break from buses and stay a while. 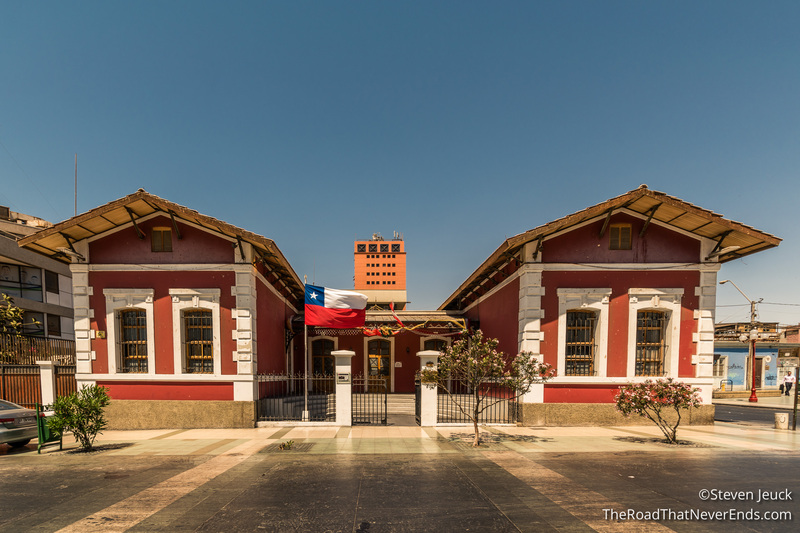 It wasn’t until visiting did we realize the importance of this city, especially during the Pacific War (Chile, Bolivia and Perú – all fighting for territory), and the Chinchorro culture. We stayed at Hostel La Paskana. We LOVED it here. Alejandro spoke English well, the room/bed was comfortable, the water was hot, and breakfast was fantastic. We had a midnight flights, and they let us hang out on their couches until we had to leave for the airport. 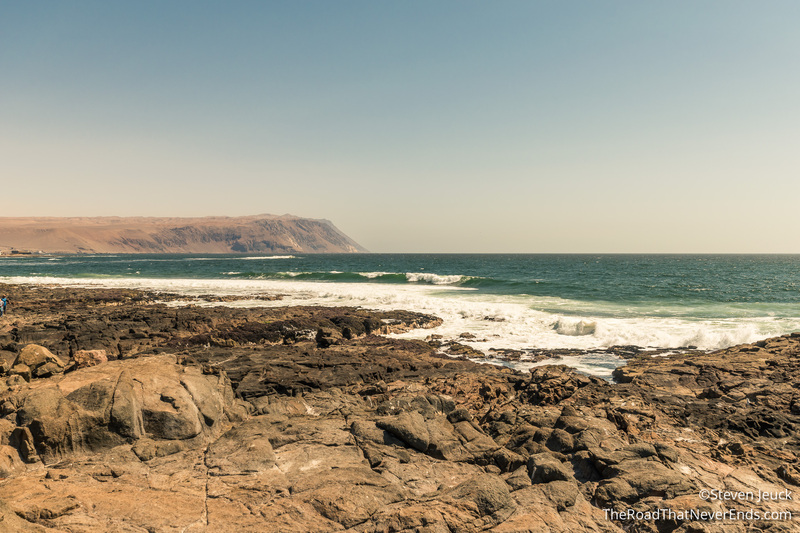 Alejandro – thank you for all the recommendations, we enjoyed meeting you and staying in Arica! 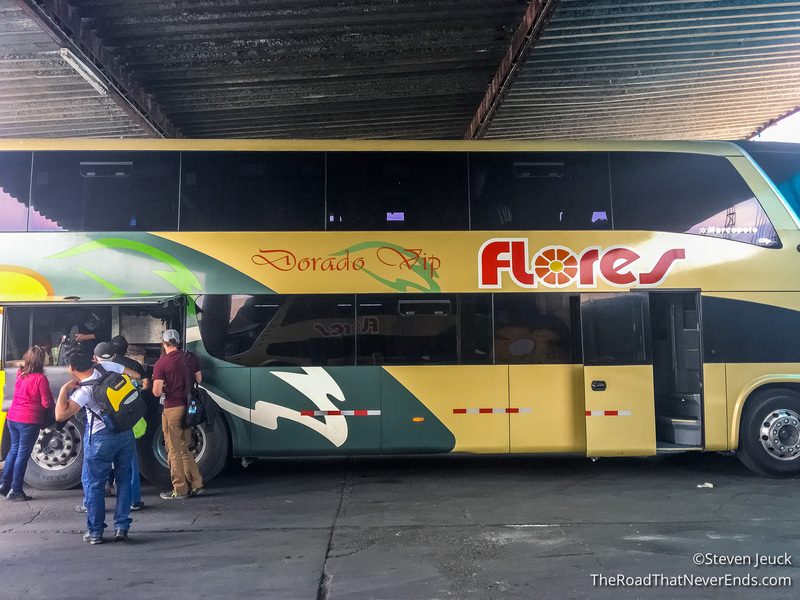 We took a bus from Arequipa to Tacna, Perú using the company Flores. The bus ride was meant to be 5 hours, but it was close to 6 – are you seeing a pattern here? Once we arrived in Tacna, the next few hours felt like an episode of Border Wars. The Tacna bus terminal we have been told is not a great place to spend a lot of time. Once we got off the bus, a police officer told us to be careful and watch our belongings. We got the message loud and clear – stick to each other, be vigilant, and don’t stay long. We had done a lot of research online on how to cross the border into Chile from Tacna: (1) take a taxi – could cost you $60 USD, (2) take a bus, $2 USD, but may take a while to get all 20 people through customs, or (3) take a collective (shared taxi) with 3-6 other people, will cost $6-10USD each. We went with option 3. The challenging part was finding a collectivo that was almost full, and looked the least sketchy. When we got into the International Bus Terminal there was about a half dozen people surrounding us asking where we wanted to go, Steve and I had to walk by them to exchange money and buy our tax (S/2) to get us out of Perú. Once we were done with that, it was time to enter the lion’s den again, and we were immediately swarmed with people who wanted our business. I don’t know how Steve picked, but somehow he picked someone and the driver walked us over to the counter to have our passports checked. Once done, he walked us to the car (late 90’s Chevy Impala), which already had 3 passengers in the back. Steve and I took our seats in the front (no seatbelts) and hoped for the best. If you read my previous posts about Perú, you would know that I think their driving is the scariest in South America. 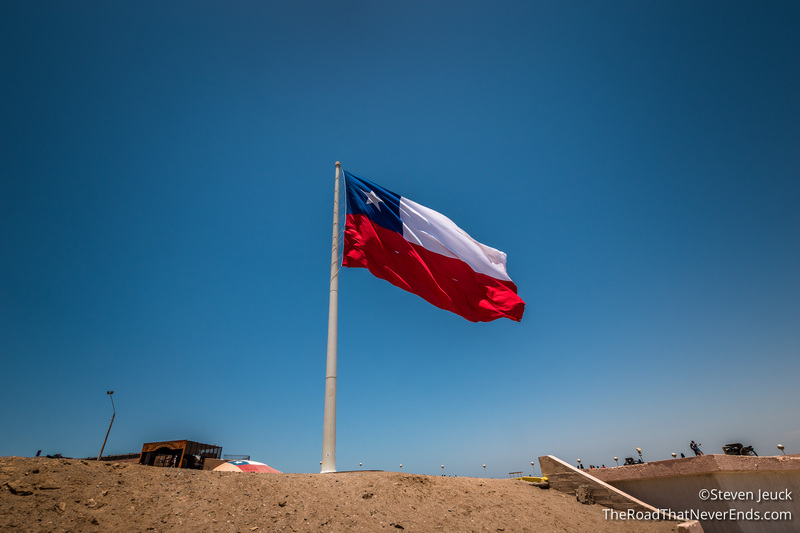 Our driver was on a mission – get us to Chile quickly, so he can be paid. We got to the border, and without even knowing the language, I know he wanted us quickly to move to the counter and all 5 of us got checked out of Perú. We hopped back in the car and made our way to Chile. Once again, we were ushered to a clerk who helped us quickly, and we had our bags checked. A bus was behind us, and I believe our driver wanted to get us cleared before the arrival of 20 passengers from the bus. Once we made it into Chile, he drove quickly to the bus station. We said our goodbyes and paid him S/18 each. From the terminal, we took a taxi to our hostel. Taxis are everywhere in Arica, I am not sure if I actually saw many cars. Uber does not exist in Arica. Also – I noticed almost immediately in Chile, how much better the driving is here, it was a huge difference. We enjoyed sleeping in, and beach bumming our first day in Arica. We also walked around the shopping area, bought me some new pants, ate dinner and ice cream, and even had a few drinks in the bars. We had read that Arica is a big party town, so we weren’t surprised to see the locals and tourists club ready after dinner. Steve and I also observed that Arica seemed similar to Santa Cruz, CA – long hair men, tattoos, surf culture – so we loved it. It felt at home, and Steve actually had a few beard related compliments! 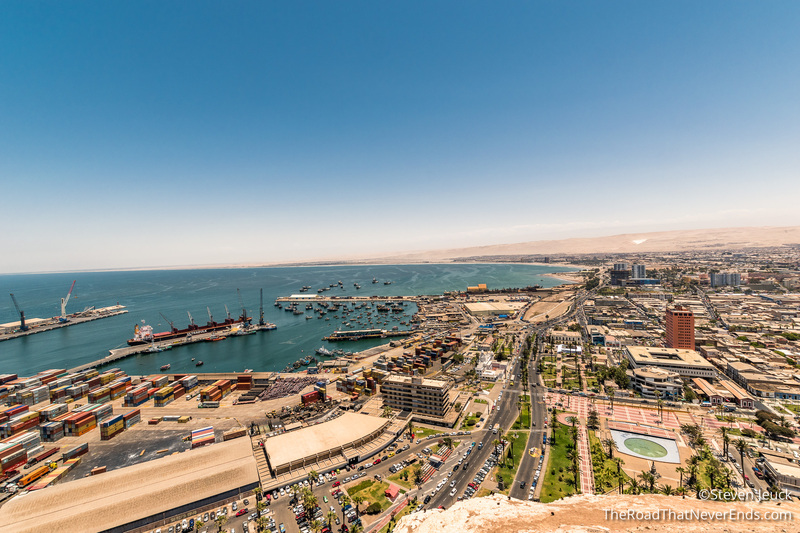 El Morro de Arica – This rocky hill is a popular site for tourists, as it offers panoramic views of the city and beaches. The hill also has historic significance, as it is the site of the Assault of El Morro in 1880, a battle during The Pacific War on June 7, 1880. 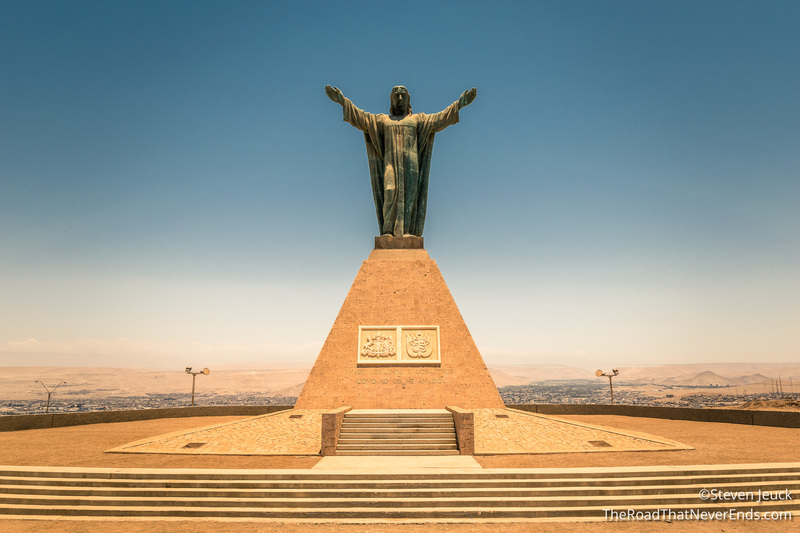 There are several monuments to commemorate the battle on top of the hill, as well as the Historic and Weapons Museum of Arica, which highlights weapons used during that time period. The museum was 1000 pesos each. Museo de Sitio Coló 10 – While an excavation was being done in 2004 for a new hotel, 87 bodies were found belonging to the Chinchorro people, who lived in this region more than 9,000 years ago. These are the oldest mummies in the world! Because of this, they weren’t able to move the mummies without badly damaging them, so they left them where they are and built a museum over them. The museum costs 2000 pesos, but it was well worth it. It includes an audio tour in English, which explains about the mummies, and the Chinchorro culture. Steve and I were surprised at how much we enjoyed this museum. Bolognesi House – The house was originally constructed in 1870 by a local farmer. During the Pacific War it was headquarters to Francisco Bolognesi, a Peruvian Colonel. It was there that the Chilean army demanded his surrender, and he refused. Two days later he was killed in the battle at El Morro. 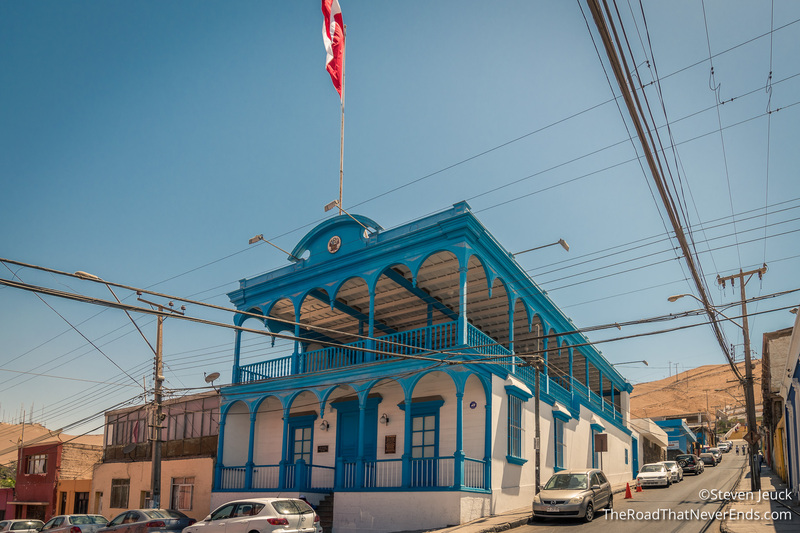 The house currently belongs to the country of Perú as per a peace treaty in 1929. 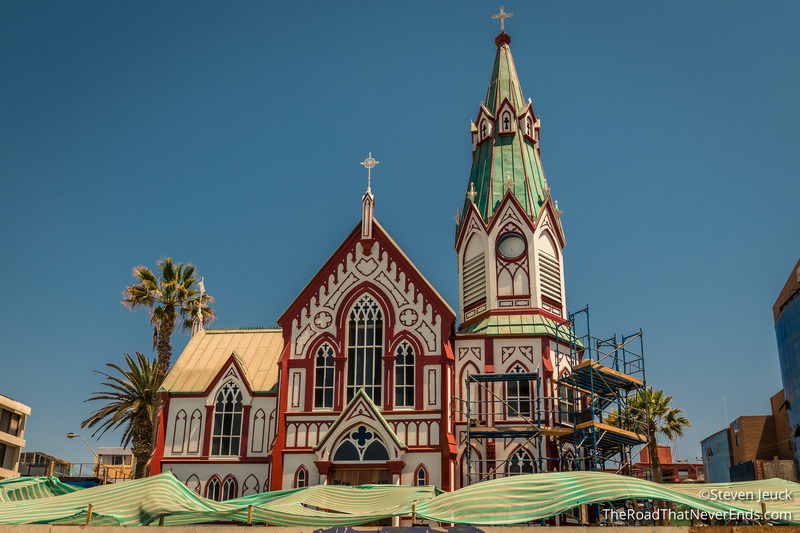 Saint Mark’s Cathedral – This church was built by Gustave Eiffel (of Eiffel Tower fame) in 1876, back when Arica belonged to Perú. During our visit, we weren’t able to get a tour because they are doing some work on the church. Government Building – This building was also built by Eiffel, after the previous government building was destroyed in a Tsunami in 1868. This current one was built in 1876, but looks as though it needs some renovation. 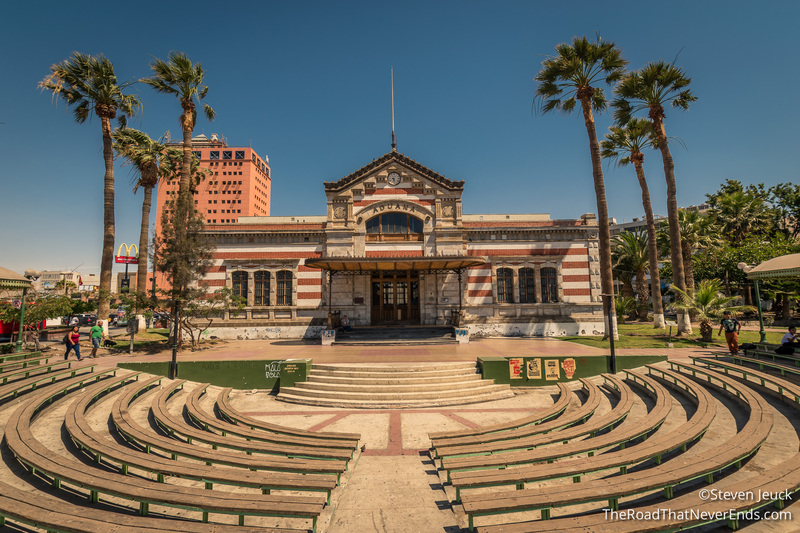 Culture House (El Edificio Ex-Aduana) – also built by Eiffel – it currently serves as place where shows are performed. 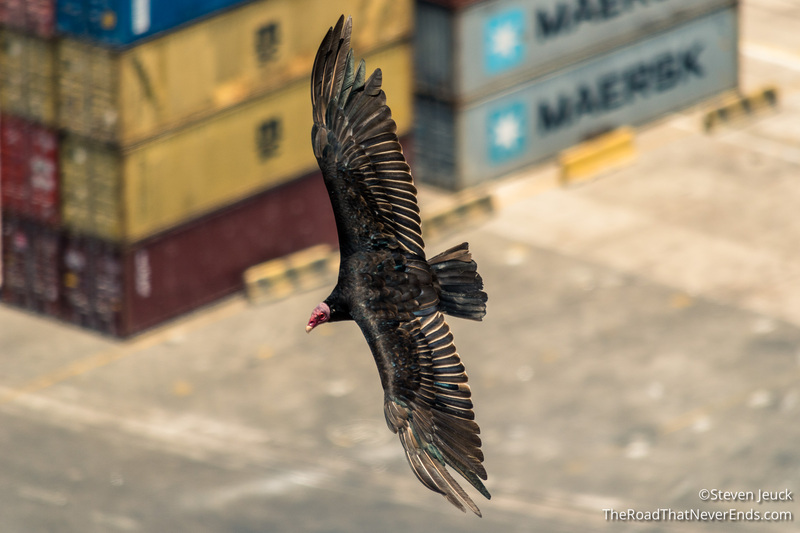 It was once the customs house, and as you can imagine for a port town, was tremendously busy.